Five years from now, few students of class 9 might know the answer -- because the new textbooks released by the National Council of Educational Research and Training mentions neither Gandhi's assassination nor the assassin, Nathuram Godse. The standard 9 textbook, titled Contemporary India, is about India in the 20th Century and covers the Freedom Struggle, developments in the world, and aspects of the Indian Constitution up to 1950. The omissions and uncalled for statements in the book have shocked academics. For instance, while dealing with the party system in India, page 99 of the book reads: "In the 1996 general elections, BJP emerged as the single largest party at the centre and formed the government. Unfortunately, BJP could not prove its majority in the house within the given time, and it had to withdraw." The new textbook is smaller in size, printed on good quality paper, and looks better than the previous textbook. History and geography are combined in the new book -- tp lighten the burden of school-going children, according to the NCERT. But what stands out are the factual errors. For instance, the section 'World: Some Developments', contains a sentence that reads: "In 1600 AD, English East India Company was established in India". The East India Company was established in London. A few paragraphs later is a reference to Madagascar island as the transit point between India and France for ships of the French East India Company. Quote: "Madagascar, an island in the Arabian Sea..."
Madagascar is in fact in the Indian Ocean. Besides the factual errors, there are mistakes that give the impression of political prejudice. The book states for instance that the Munich Pact was "the first pact signed between Hitler and Stalin". Page 9 reads: "It is interesting to note that Stalin was the first European leader to enter into a peace-agreement with Hitler, maybe to buy peace for some time." The Munich Pact was signed between Hitler and Britain and France in 1938, a whole year ahead of the Hitler-Stalin pact. Sins of ommission are equally numerous. Thus, one of the most important events of world history, the Holocaust, is completely missing. Further, Page 10 states: "Nazism and Fascism were a sort of counterpart of the dictatorship of the proletariat imposed upon the Soviet Union by Joseph Stalin." The bias is more pronounced when it comes to the famous Quit India Movement launched by Mahatma Gandhi in 1942, which led to India's Independence. The NCERT textbook for standard 9 blandly states: "The Indian Communists and followers of Jinnah [Muslim League] were perhaps the only political groups who did not support such a strong and widespread movement." Historical records however show that besides the Communists and the Muslim League, the Rashtriya Swayemsevak Sangh and the Hindu Mahasabha also did not participate in the movement. The omission of the RSS [which is closely affiliated with the Bharatiya Janata Party, the largest party in the National Democratic Alliance coalition government at the Centre] and the Hindu Mahasabha [whose political views are close to that of the RSS] is being seen as a deliberate attempt to hide the role of the RSS in the Quit India Movement while seeking to show the communists in poor light. Fumes eminent historian Professor Mridula Mukherjee, "Why have they forgotten the RSS and the Hindu Mahasabha? It is not an omission but a deliberate attempt to hide the role of the RSS and the Hindu Mahasabha." Mukherjee reasons that the book's authors have omitted Gandhi's assassination in order to avoid mentioning Nathuram Godse's links to the RSS and the Hindu Mahsabha, and the subsequent banning of the RSS after Gandhi's murder. Mukherjee is also angry that the textbook dismisses the first phase of the Indian National Congress history. "These books refer to the leaders of this 40 year phase starting 1860 as mere petitioners. It is an attempt to subvert the history of Indian National Movement," she states. Adds historian Arjun Dev, who had authored one of the NCERT's earlier textbooks, "Reading this kind of stuff can be good fun but not when you know that this book is meant to be compulsory reading for school students." Differing with most authorities on ancient history, the NCERT textbook describes the Harappan civilization as "Harappan", "Indus", or "Indus-Saraswati" Civilization. "Apart from a few known pro-RSS historians, nobody accepts the theory of the Indus-Saraswati civilization," remarks Professor Mukherjee. Moreover, the textbook describes the area of the Harappan civilization as 12 times that of the Egyptian and Mesopotamian civilizations combined. However, renowned historian Professor Irfan Habib says that as per internationally accepted history, "It was less than double the area of Mesopotamia." In dealing with the economic life of the Vedic civilization, the reference to the cow being the most important animal is in bold letters. Also in bold letters is the punishment for injuring or killing a cow: by expulsion from the kingdom or the death penalty. An apex body of historians, Aligarh Historians Society, has accused the books of being casteist in approach. "The textbooks black out the whole question of Dravidian participation in the Indus Civilization and of Dravidian influences on both Vedic life and later, on Sanskrit. Then, a neutral stance has been taken in the books over the caste system. It would appear as if Dalits were never a part of our society, and that the shudras never received any ill-treatment," states Professor Habib, who heads the society. In his foreword to the Class 9 book, NCERT director J S Rajput says, "I hope this book will help the learners to become well informed, rational, and responsible citizens who will participate effectively in the process of development and nation-building." But Rajput has outraged rational historians and, according to them, earned Indian history a comparison with the distorted versions of history put out in Nazi Germany and, more recently, in Pakistan. 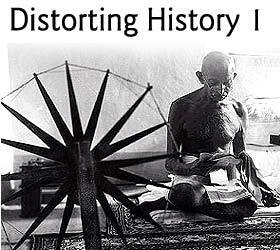 "The new NCERT textbooks are not about rewriting or updating history but communalising history. The authors are not using new methodologies but going by 19th century interpretations of history, where religion played a very important role," comments Professor Bipin Chandra, one of India's best-known historians. During the 1977 Janata Party government, the Jan Sangh -- the predecessor of the BJP -- had demanded the removal of the NCERT history textbooks. The demand was rebuffed. When the BJP assumed the reins of power in 1998, Murli Manohar Joshi, known for his right-wing views, took charge of the Human Resource Development Ministry, which oversees education. It was decided to revamp the entire curricula for schools and Rajput, who earned his doctorate in physics under the supervision of Joshi, was placed in charge. Many see the claim or revamping as an excuse to remove the present history textbooks, which were mostly written by left-leaning historians. The changes are not confined to history. In December 2000, the BJP-led government brought in a raft of proposals for changing the curricula. The proposals called for the teaching of Vedic mathematics (an ancient form of math with few modern applications), and herbal and ayurvedic medicine, as they are "examples of India's contribution to world thought". Joshi also emphasised on inculcating "Indian values" as a vital part of teaching history. Incidentally, many private schools and the West Bengal, Delhi, and Bihar governments have refused to introduce the new textbooks.